9 Funny, Amusing, and Off-the-wall Reasons for Mom or Dad to Choose Children’s Dental Zone! Let’s get real here…when it comes to selecting a dentist for your child there is certainly not a shortage of options (it seems like there’s a dental office on every corner in the Alpharetta, Johns Creek, and Roswell areas). Most of those are general and family dentists and while most of them are great at treating adult patients, they don’t have the expertise that comes with 2-3 years of extra education and, more importantly, seeing kids, all day, 5 days a week (we love it!). Again, quite a few places to choose from and all of them are going to say they are the best, but how do you really know? Instead of writing a “marketing piece” for our office we figured we would just let our patients do the talking and combine it with a little bit of our own commentary. What we’ve done here is scour the internet, look for a few unique, amusing, and off-the-wall reasons that parents choose Children’s Dental Zone. Nothing wins you a “parent of the year” or “super mom” award like selecting a dentist who your kids actually WANT to come see. It seems impossible (I know I never wanted to see the dentist as a kid), yet here we have Krista, whose three kids love the slide and video games (we like to think they like our dentists and amazing team members, as well…or maybe it’s just the parents that like us). Sorry, Caroline. We can’t make your dentist office as fun as ours (although we can write a strongly-worded letter to your dental practice, if you wish…kidding). Besides, would it be weird if there were tunnels, slides, and a movie theater at a general dentist’s office? Caroline, if you really need to crawl through a tunnel at a dental office you can do it at Children’s Dental Zone…we won’t tell your friends! Wink. 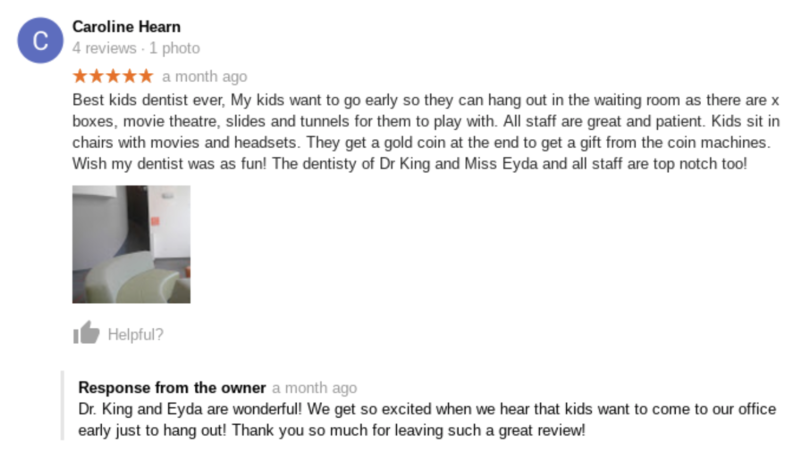 Fortunately the kids love Children’s Dental Zone, had great appointments, and are apparently begging to come back. Who knew that kids could actually look forward to going to the dentist? 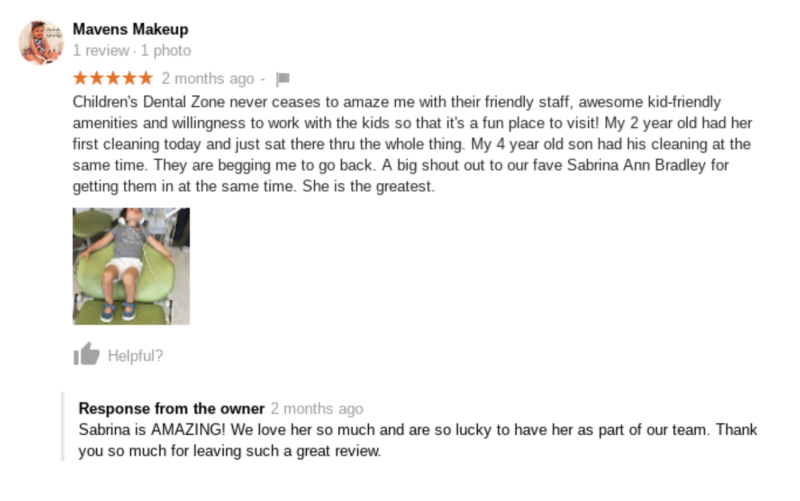 She had a friend recommend Children’s Dental Zone to her and now she’s recommending us to you (thanks, Sara)! 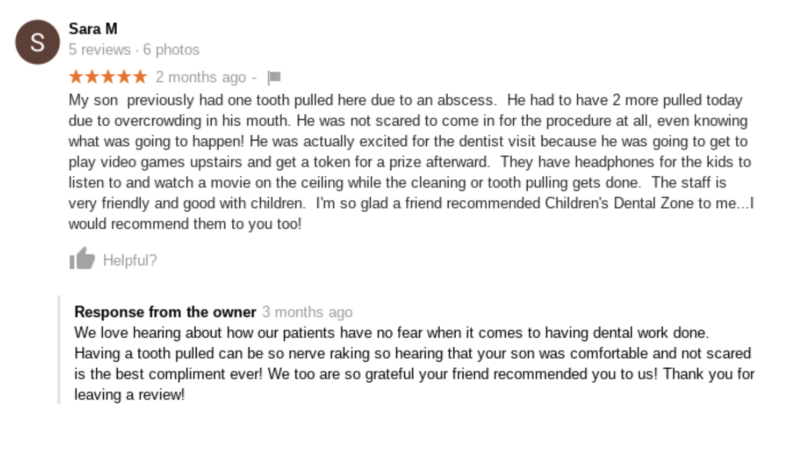 Okay, if you want to learn the “heart” of Children’s Dental Zone, just read the above review along with our response. 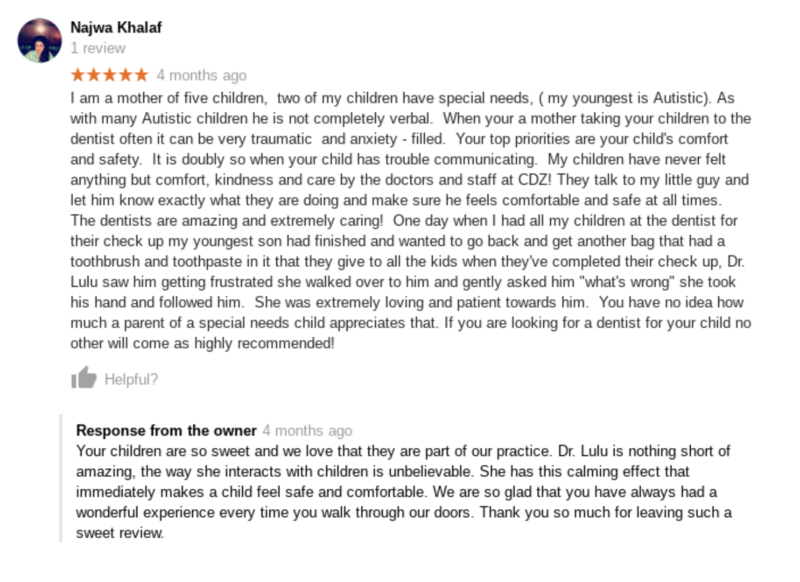 Najwa and her children are amazing; and how Dr. Lulu and the rest of our team interacted with her youngest autistic son will hopefully give you a glimpse into how much we genuinely care about each patient. We love, love, LOVE what we do and who we serve! 7 Six Emojis? We Must be Doing Something Right…Thanks, Marsha! While we don’t claim to be completely fluent in emoji, we’re pretty sure this is a positive review! Thank you, Marsha, for all of the love and support you show to Dr. King and the rest of our amazing dental team at Children’s Dental Zone! 8 The Disney World of Dentists (Maybe the Single Greatest Compliment Ever)! It’s no secret that Disney World is one of the greatest places on earth for kids, so when this precious little girl referred to us as the “Disney World of Dentists,” we were floored. Mom also wanted to mention that our facility is modern, technologically advanced, and that she was thoroughly pleased with Dr. King and Dr. Lulu. 9 Amazing Care, Amazing Team, Amazing Moms, Amazing Kids, and Amazing Smiles! While we hope you were entertained reading this, what we really hope is that you understand our core message. 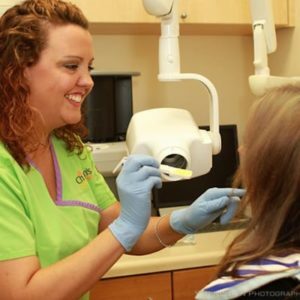 Dr. King and the entire team at Children’s Dental Zone work hard each and every day to ensure that parents and children have an amazing experience while they are here. We don’t think visiting the dentist has to be “traumatic” for a child, even if that is the experience you had growing up. We’ve created a different type of practice with a different type of environment, not only to provide great dental care to your children, but also to positively reinforce that dentistry is a “good thing” and not something that should be feared. By helping kids to develop the right attitude regarding dental care at an early age, we hope to instill healthy oral care habits in your children that will last a lifetime. If you’re looking for a pediatric dentist for your child, look no further than Children’s Dental Zone. You can schedule your appointment right here on our website, or if you’d prefer to meet us and “scope out the place” before scheduling your appointment, feel free to drop by our Johns Creek pediatric dental practice at any time. We look forward to meeting you and the rest of your precious family!